The best thing about it? The cheese is made in New Zealand by Alice and co from Angel Food (and I can buy it at my local supermarket which is pretty exciting if you ask me). I have many more adventures to tell from our summer but in the mean time you should follow the Godzone Adventure Race which many of our friends are about to start tomorrow morning. Exciting times (you'd be surprised just how exciting it is to watch the little trackers move around the screen)! I always knew that the homeward leg was going to be a bit tough. For a start, I didn't want to go home...I wanted to keep on biking all day, every day! We decided to hang around and laze in the sun (well, actually the shade as the sun was too hot) most of the day in Tekapo (after a morning run up round Mt John to take in the amazing scenery) before riding the short distance to Fairlie in the late afternoon. In retrospect we perhaps left it a bit too late in the afternoon as the wind had picked up a lot and it felt a bit like riding backwards! The wind died down a little bit over Burkes Pass but it sure got colder! We had a glorious cabin at Fairlie and managed to do a mountain of washing and eat a mountain of hot chips. Yummy! The next day we decided we didn't want to take the long route round to Geraldine which that meant we were going to be riding on a fairly busy bit of highway so an early start was required to beat the traffic. Worked pretty well but it sure was a cold start! I was feeling pretty cheerful especially when I got to go to the chocolate shop and buy copious amounts of fresh raspberries. After a super long stop at Geraldine we headed off to Peel Forest and the lovely DOC campground there. Unfortunately it was still pretty drizzly which is never fun for putting up tents. There are some lovely walks through the bush here...we only explored a fraction of them. I shall have to come back another time. The next day was again rather drizzly and cold in the morning and was fairly uneventful apart from meeting a few cycle tourists all heading the other direction (it must have been because it was drizzling right?) and getting brain freeze from ice blocks in Mount Somers. I'm not sure why, on all the days when it was super hot, we never got ice creams or ice blocks and yet on such a cold day we did! Clockwise from top left:The General Store at Mount Somers, Moas! !, enjoying the view at Rakaia Gorge, our campsite at Rakaia gorge. What you can't see is the amazing view over the river it had. The whole way to the Rakaia Gorge until the final descent felt like one long gradual climb, sucking all the life out of my legs! But it is such a lovely campsite to stay at. The last time I was here was for Spring Challenge a few years back after we'd rafted down the river. One more day to go and then we'd be home. Left: desperately trying to get all my gear into my pannier one last time. Right: posing whilst overlooking the Rakaia river. We woke up the next morning to thick mist, barely able to see more than a few metres ahead of us. Whilst cooking breakfast though it slowly started to burn off and blue sky was peeking through. The ride out of the gorge is a really nice little climb then it was long, straight, flat roads for ages. M was in semi time trial mode from the 22km to Hororata sign right the way into the town which was amusing but we made it in 41 minutes so he was happy and I was impressed as the wind was pretty cruel. We were making excellent time and were both feeling pretty good so we pushed on to Tai Tapu for lunch. 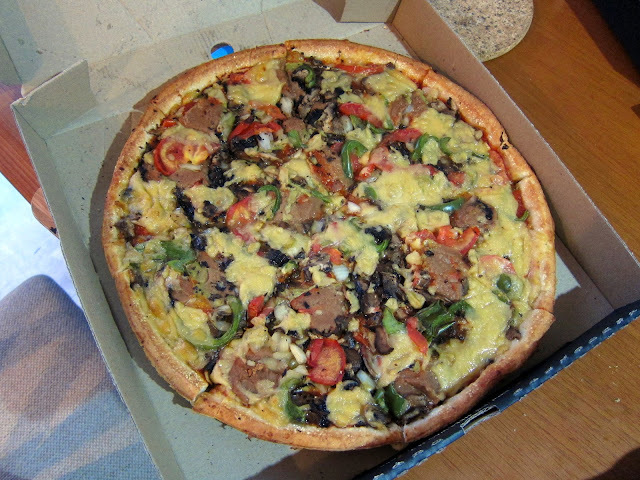 Feasting at The Store in Tai Tapu to celebrate before tootling home at last. I even convinced them to make me a massive soy milk shake...delicious. After eating far FAR too much it was time for the final few kilometres to home on familiar ground. The Old Tai Tapu Road is where we ride the Tuesday night Time Trials most nights during the summer and it was kind of fun to be riding it without the pain and suffering we're normally feeling by this stage of the ride! And then all of a sudden we were home. It felt kind of happy and sad at the same time because it had been such an amazing adventure but I had kind of missed our little house too. 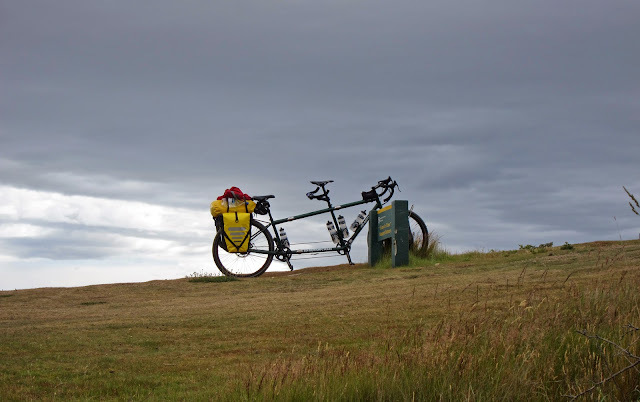 Is it too early to start planning our next cycle touring adventure? And one last bonus photo from our awesome adventure with the big green monster: M waving goodbye to the West Coast. I miss the coast! 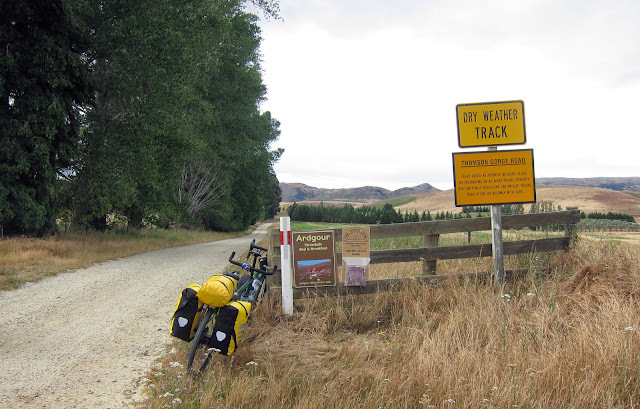 Omakau, in Central Otago, is a small town partway along the Otago Central Rail Trail. A couple of years we rode the trail with M's sister and some friends, managing to find the only 3 days of freezing cold rain during a long stretch of ridiculously hot weather. This time the sun was most definitely out and we were loving a bit of easy riding and all the friendly people on the trail including these two Aussie ladies with the most awesomely cute Bike Friday bikes. 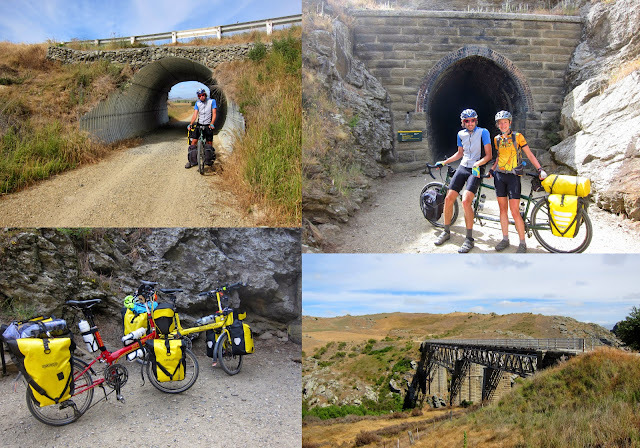 The Otago Rail Trail with the Poolburn Viaduct (bottom right), one of the tunnels on route (top right) and cool bikes (bottom left). 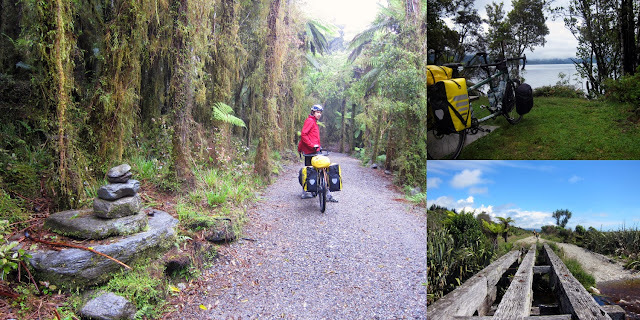 We were only riding the 29km from Omakau to Oturehua before heading off towards the Omarama Saddle but I think it's probably my favourite section, with a cool long tunnel and the Poolburn Viaduct. 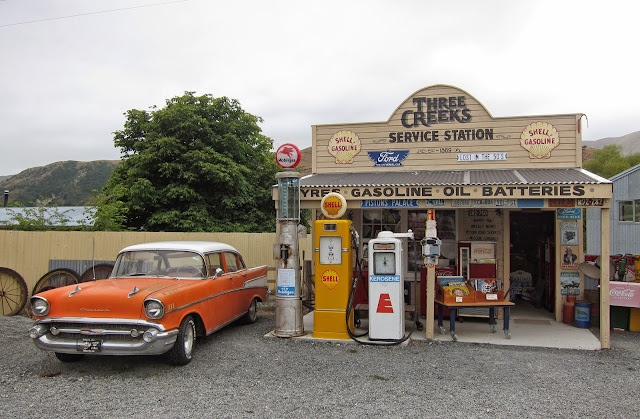 Plus there is a very cool General Store at Oturehua. After a delicious early lunch we set off in the direction of St Bathans. A few kms before St Bathans is the turn off towards Oteake Conservation Park. 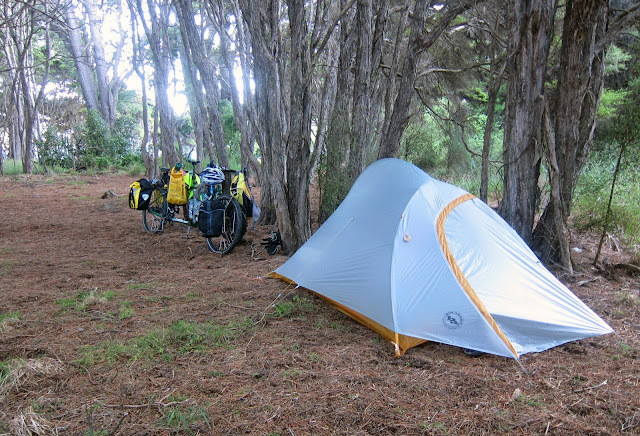 The gravel road felt like it went on for ages but we finally reached the Homestead campsite where we lazed under a tree eating chips for a while to recuperate a bit. From there we headed up the valley on the West Manukerikia Track, aiming for Top Hut at the bottom of the Omarama Saddle. The track was pretty good for the first 3km to the junction then got pretty bumpy and rocky with many stream crossings (over 20!) we pushed through. I don't think we could have gotten the tandem through most of them even if we'd tried. The water was super refreshing though as it was pretty hot by now. A gorgeous day on the West Manukerikia Track. We made it to Boundary Creek Hut after about 1 1/2 hours with lots of daylight remaining so continued on the next 8km to Top Hut which took us another 1 1/2 hours. We were both exhausted by this point and super excited to reach the hut. I have to say, this track was definitely pushing the boundaries of what our bike is capable of! Fully laden with no suspension makes riding across all those rocks was pretty rough going! Can we get a dual suspension mountain bike tandem please M?!! Left: Top Hut on the West Manukerikia Track. Right: shoe repairs with electrical tape and strapping tape. We'd discovered my mountain bike shoes were falling apart so the left one had to be held together with electrical and strapping tapes! They have had a good life though, lasting nearly 8 and a half years, with the last few years definitely being thrashed. Anyway, what's the best way to start another day of cycle touring? How about climbing nearly 300 metres in just over 1.5km! Definitely got the lungs working! We did have to push a little bit when we wobbled a bit out of control on the rocky track but otherwise the tandem seemed to be loving it! The descent on the other side however was a bit rough going for our poor brakes, being over 600 metres of steep, rocky gravel. Exhausting! Although a few years ago we rode our mountain bikes up this side and onto the ridge above the saddle (only to have to turn around due to icy snow on the tops). Letting the discs cool down (and admiring the awesome scenery) on the descent from Omarama Saddle. By the time we arrived at Omarama the heat was getting a bit riduclous and it wasn't even midday yet. 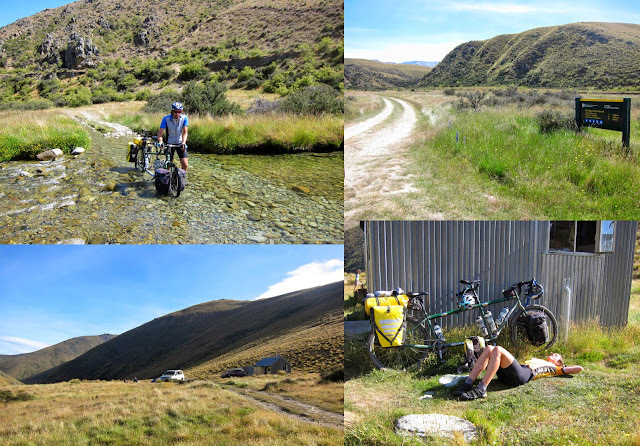 We gorged on fresh stone fruit and tried to cool off a bit before setting off onto the Alps 2 Ocean Cycle Trail towards Twizel. This is where a lack of reading the notes caused a bit of grief. For some reason I'd managed to mistake the trail distance to Twizel as being only 40km from Omarama but not long after we set off on our way I realised it was actually 80km! You know, just a small difference when it was already 1pm. 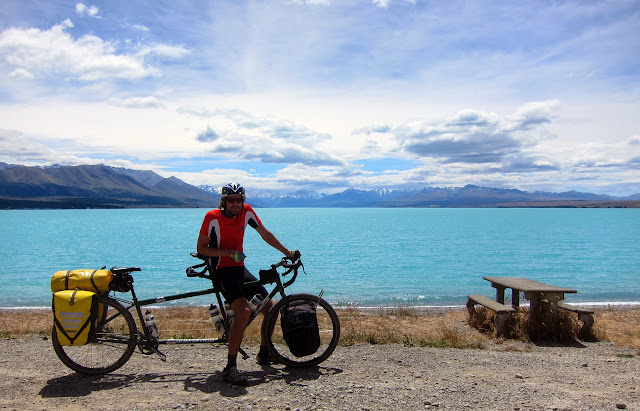 Now a sensible person would be like, yeah, let's stay at Lake Ohau instead (40km) but sometimes I am far too stubborn for my own good so Twizel it was, no matter what! We were doing the trail backwards from Omarama to Tekapo which meant it was basically heading on it's way up. 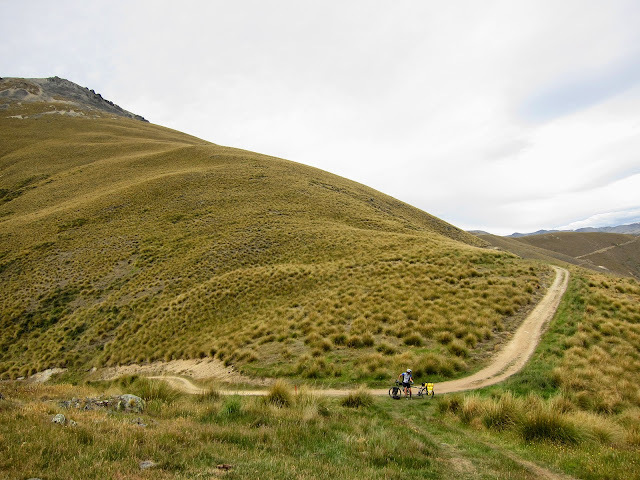 The trail heads inland towards Lake Ohau via a pretty awesome single track around the base of the Ohau Range with about a 400 metre climb to its highest point (going our direction). Fortunately it's a pretty nice gradient and flows really nicely. But I was still pretty tired by the top. We then had to do some bike maintenance as the front brake pads were wearing pretty thin (VERY thin). We didn't have any spare ones (the list of spare parts we should have had with us was growing by this point!) so M just did a switch which got us down the hill okay but he took things pretty carefully just in case. A hot day on the Alps 2 Ocean Cycle Trail (so hot that dunking your cycling top in a freezing cold stream was essential to stay sane). I was grumpy and tired by the time we reached Lake Ohau Lodge but a bottle of ginger beer did help a bit. We then headed off along the super whizzy single track around the edge of the lake. It was fantastic, even for someone as tired as me! Then M got into time trial mode for the last 20km along the canal road into Twizel! After a delicious dinner from the local Thai restaurant M was super kind and got us a cabin for the night so I could attempt to recover! After a lazy morning then some more bike maintenance (we managed to find one set of brake pads - yay!) we were on our way again, just in time for the heat of the afternoon! 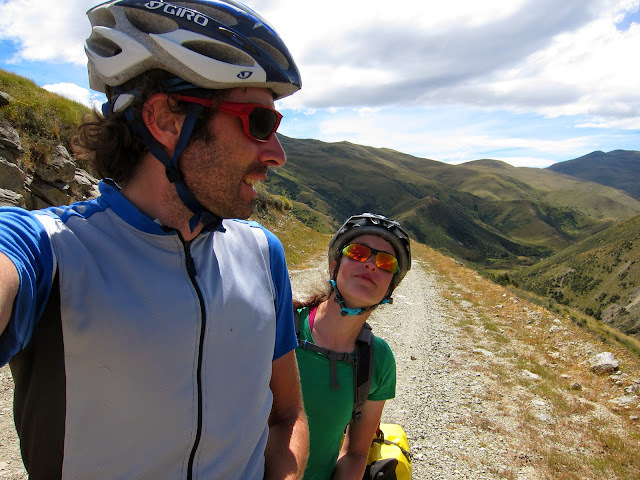 Because we were both pretty tired it was a pretty cruisy ride from Twizel to Lake Tekapo via the Alps 2 Ocean Cycle Trail which was mostly on a gravel track around the edge of Lake Pukaki then along the canal road into Tekapo. Despite being a short day my legs (and bottom!) were feeling rather shattered and I was too tired to go for a swim. The campsite down by the lake front in Tekapo was so busy we ended up camping amongst the trees right down by the lake which was quite cool. 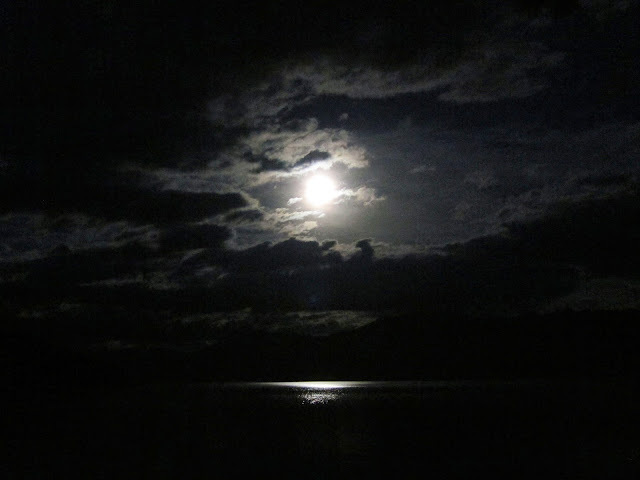 A bonus picture by M from Tekapo in the evening. Looks a bit spooky! We awoke the next morning to the delightful sound of thunder and the rain hammering on the roof so I promptly went back to sleep for a bit longer. By the time I awoke the lightning and thunder were so close together I'm pretty sure it was right on top of us. 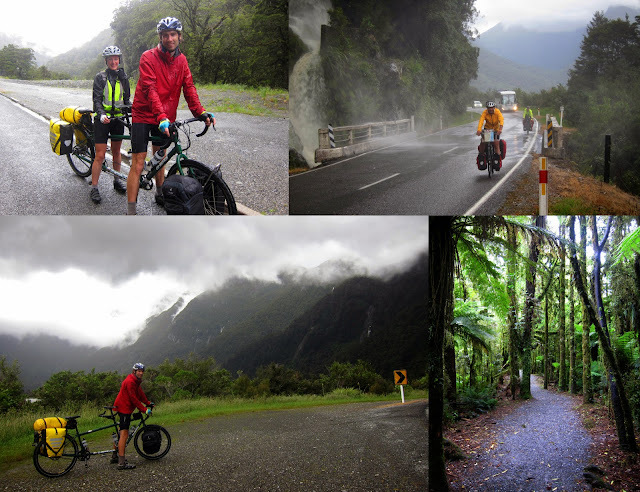 It sure didn't look good for cycling so we started trying to come up with some plans ranging from staying another night in Haast to seeing if it cleared up by the afternoon and just biking 40km down the road to the DOC campground at Pleasant Flat. 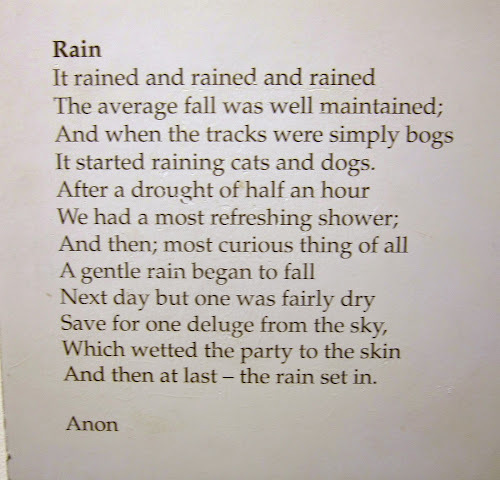 Found at the Haast Visitor Centre! Somewhat fitting don't you think? Come 10am though the rain had eased (eased, not stopped) and there hadn't been thunder and lightning for a good half an hour so we thought, what the hell, let's give this a go. The road from Haast makes its way inland following the Haast River before you begin the steep climb up to Haast Pass. The mountains drop steeply everywhere you look and the benefit of a bit of rain is that the waterfalls come out to play. Even better is being on a bike where you can see it all in its magestic glory. About half an hour up the road we caught up to a couple of cycle tourists from Austria who were also out enjoying the weather! We were riding a bit faster than them but tended to stop more as we weren't under a tight deadline (they were aiming for Wanaka that night) so spent most of the day with them which was pretty cool, especially huddling under the shelters at Pleasant Flat (along with the sandflies) for lunch! By this point the rain was starting to return in full force and the temperature was definitely not tropical! Hiding from the rain at Pleasant Flat. 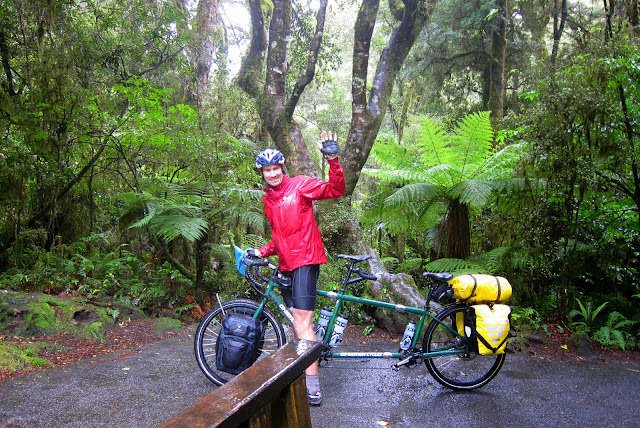 After lunch we passed through the Gates of Haast and started the climb. It's pretty fortunate we like climbing as this was one pretty big, steep hill. At least there were a couple of waterfalls to visit and rest the legs at. At one point during the climb some guy pulled his car over and jumped into the middle of the road to take photos of us! I imagine to those passing in vehicles it probably looked like a miserable experience, riding a fully laden bike in the pouring rain but actually I was quite enjoying myself! 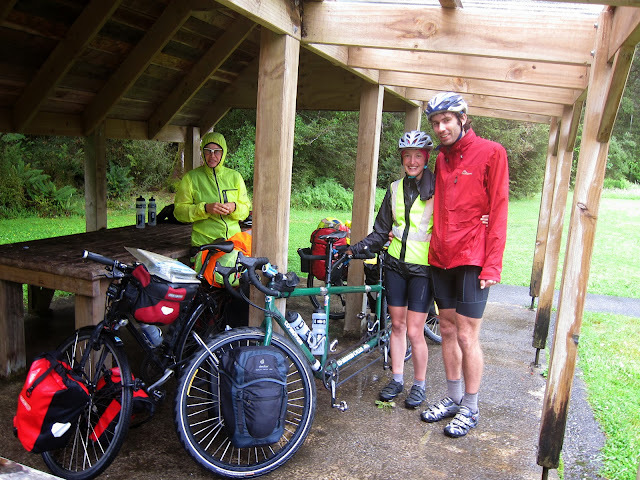 A wet day on the way to Haast Pass. We made it up to the pass in pretty good time with high hopes that the sun might reach us (you know, having left the West Coast and all that) but it was not to be. In fact, it was a ridiculously cold descent to Makarora where we arrived to find the cafe had no power and therefore no hot drinks (tragic!) but they did have a fire so we sat there for a while trying to defrost before heading off again. We finally pulled into our campsite at Boundary Creek just as the rain was starting to ease. Camping amongst the trees at Boundary Creek. After several days on the road we hadn't really seen many cycle tourists (we defined it as being self-sufficient and carrying all your own gear) until today...where we saw at least 20 others, even another tandem. So basically we came to the conclusion that cycle tourists only come out in the wet weather, especially when it comes to the West Coast! Anyway, despite it being New Years Eve we went to bed once the sun went down and slept through the night. We are clearly nanas (I think it's been a while since we've actually had a New Years where we've been awake)! The next day dawned sunny but cold. We set off along the road only to find that we'd managed to brake a spoke. It had probably happened early the previous day (we had heard a strange sound, like the sound of a twig braking but hadn't seen anything amiss at the time although we didn't check the spokes as it hadn't occurred to us). Not so good. Luckily it wasn't a huge distance to Wanaka (about 50km) but it was New Years so we weren't super optimistic about finding a bike mechanic. It was a pretty cruisey ride into Wanaka with glorious views of both Lake Wanaka and Lake Hawea but I have to say I was glad to arrive in Wanaka, especially to find not 1 but 2 mechanics on duty at Racers Edge Torpedo7. Thank you so much guys for fixing our bike!! They were joking that it was so fancy it was from the future so I think we gave them a little bit of excitement. It was hot by the time the bike was finished so it was time for a swim in the lake (cold!) and some lazing in the sun reading my book (a kindle is absolutely brilliant for this kind of trip). Wanaka is beautiful but in summer it is so ridiculously busy and noisy and really not for people like us who don't like partying or staying up late (makes us sound so old!). We were pretty glad to be leaving and heading towards quiet roads and exciting adventures the next morning. 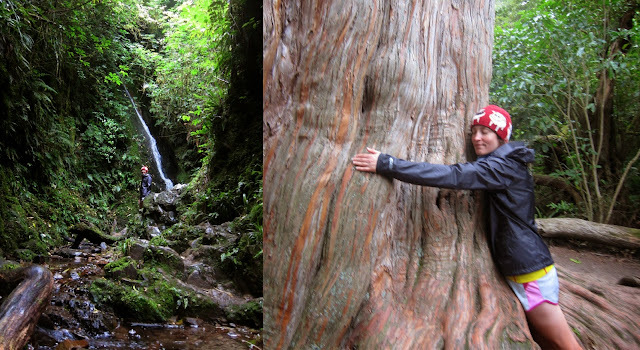 The plan was to head over Thomson Gorge Road to Omakau. 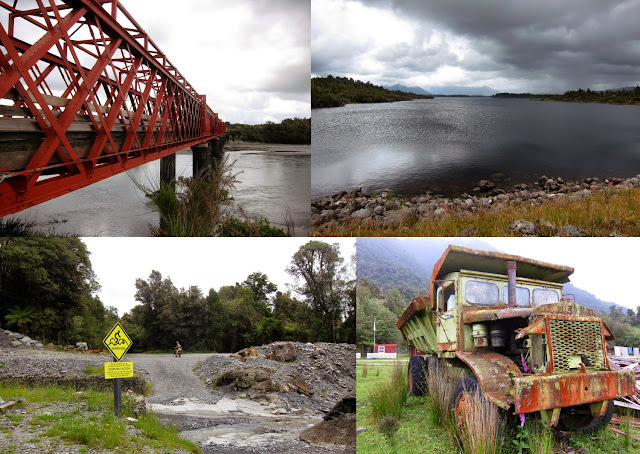 We checked out the Clutha River Trails on the way but after 2 frustrating obstacles (a fence we couldn't get through without removing all our gear and a bridge with steps on either side which also required removing our gear) we bailed and continued along the highway. Once finally onto the gravel roads our mood started to rise and I felt a sense of relief. Wanaka had been so busy that it almost felt like I'd been holding my breath the whole time. The start of the Thomson Gorge Road. Thomson Gorge Road is a remote high country 4WD road across the Dunstan Mountains with early gold mining and pastoral history. It starts off nice and gently through mostly flat, open farmland but you can see the Dunstan Range rising steeply in front of you. Once it starts climbing your legs soon know about it. Fortunately the views are spectacular and there are a few old batteries to have a look at. Parked up by the "Come in Time" Stamper Battery. It wasn't too hot for the ascent which was a relief but it was pretty windy up at the saddle and then the sun came out in full force for the descent (which actually has a lot more climb than I expected...like A LOT more!). 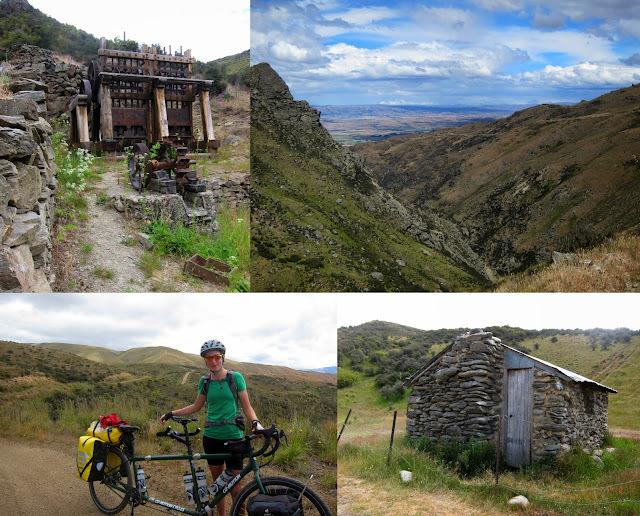 Clockwise from top left: "Come in Time" battery, the Thomson Gorge, an old stone hut just after the saddle, chilling at the saddle. Once the descent proper began we had to stop a few times to stop the discs (our tandem has cable disc brakes - they may be super big but we were also fully loaded so that's a lot of force going through the discs to slow us down and keep the bike under control) from overheating too much as it was pretty long and steep. My wrist was ridiculously sore by this stage which was frustrating but it was a fantastic day. Just as we were about to turn back we saw a lady crossing the river carrying her dog. She seemed to be making good progress despite the water being waist-deep. We made our way back down to the river bank to meet her and see what it was like. M is vastly more experienced and confident in rivers than me so he helped me across then proceeded to make several trips carrying all our gear and then, finally, the bike which was really quite impressive and I wished I'd taken a photo but at the time I was more concerned about him losing his balance in the current. Once on the other side it was a quick ride into Ross for a walk around some of the historic sites (M has some family history here) before carrying on to the DOC campsite at Lake Ianthe for the night. It's a beautiful spot but, like pretty much everywhere on the West Coast, you are sharing it with an awful lot of sandflies! 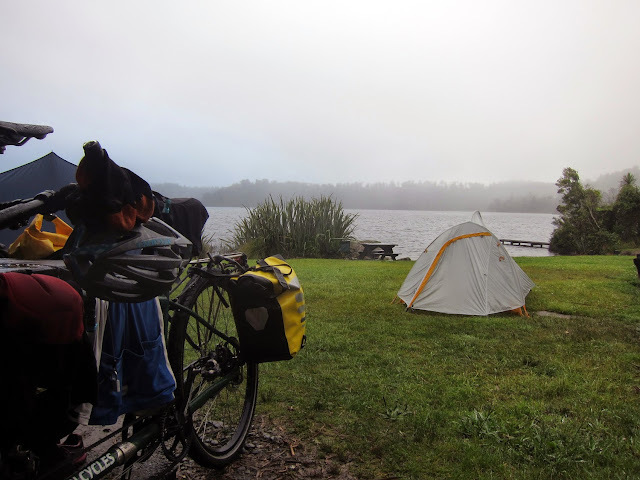 A drizzly morning at Lake Ianthe. The next morning started off pretty drizzly which made packing up a little tricky but it wasn't long before the sun came out in full force. The plan for the day was to ride down the highway to Fox Glacier, stopping at Franz Josef for lunch and supplies. It was pretty tough going after the adventures of the day before and we both were constantly hungry! Consequently it took us a bit longer to get to Franz than my stomach wanted it to! After a bit of a grey, drizzly start to the day the sun was out in full force. Unfortunately just as we were pulling in, so too did the rain so we ended up eating lunch under a bus shelter hoping it would clear up soon. I possibly shouldn't have wished so hard because the last 23km section to Fox Glacier was ridiculously hot and we both managed to get sunburnt! The road between the 2 glaciers is absolutely beautiful though, complete with 3 delightful climbs to test weary legs. Left: Fox Glacier. Right: gear explosion at the Fox Glacier campground! After pitching our tent at the campground, we took the bike for a spin on the mountain bike track out to the glacier carpark and ran the rest of the way up to the glacier for a look. Good times! I think I fell head over heels in love with Fox Glacier. I want to go back. The next morning we got up a bit earlier to try and beat the forecasted weather bomb to Haast as we'd booked a cabin the previous day after hearing the weather forecast. We thought we might have to ride the final coastal section in the rain but aimed to get as much of the ride done before it arrived. We were both feeling lots better today and the scenery just got better and better and the traffic less and less. We even managed to score free food and encouragement from the tour guide of a commercial cycling tour making their way down the coast which was pretty cool. We also discovered New Zealand's 8th most loved beach (apparently), Bruce Bay (just after getting drenched by a typically heavy West Coast 'shower'). I can't say it is a beach I would love to hang out and go swimming at but it sure is spectacular. Bruce Bay, apparently the 8th most loved NZ beach. I just can't explain how magic riding down the coast was. I think we both wished we'd had more time to explore more. I did get a bit tired near the end of the climbs around Knights Point but it was awesome. The coast is so wild. 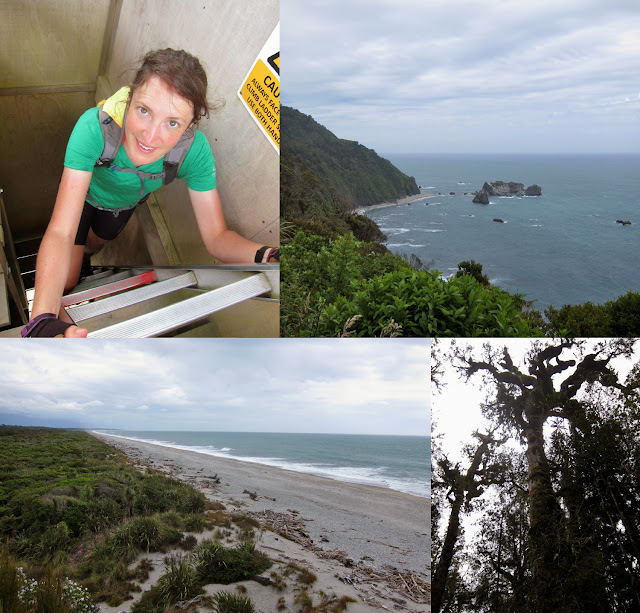 We stopped at Ship Creek and wandered around the various tracks through the dunes and bush before continuing along the final stretch of road into Haast. 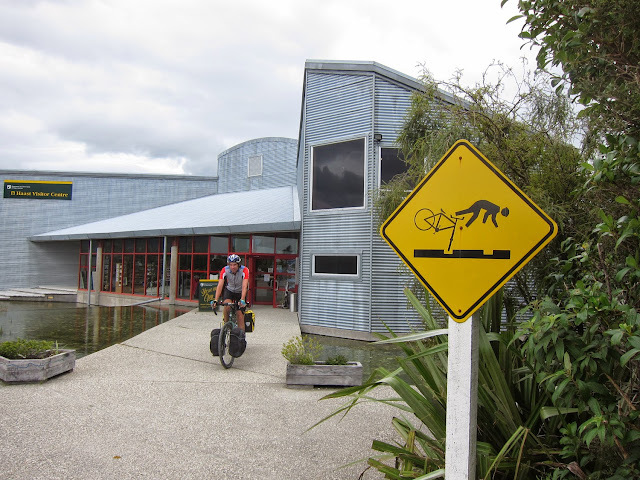 Dangerous times at the Haast Visitor Centre! After a bit of mad packing on Christmas night (desperately trying to cram everything in) we set our alarm for an early start the next day. 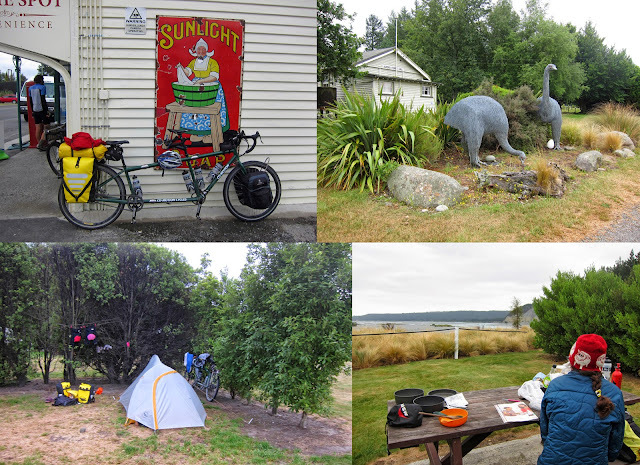 I can't say I was thrilled to hear the alarm go off in the morning but we got ourselves underway, if not a little wobbly, and biked off to the train station for stage one of our adventure: the Tranz Alpine train journey from Christchurch to Greymouth. I have always wanted to do this train trip and it was seriously cool (well, I do quite like trains!). I loved how you were provided with headphones which gave you commentary on the land and its history as you tootled along. 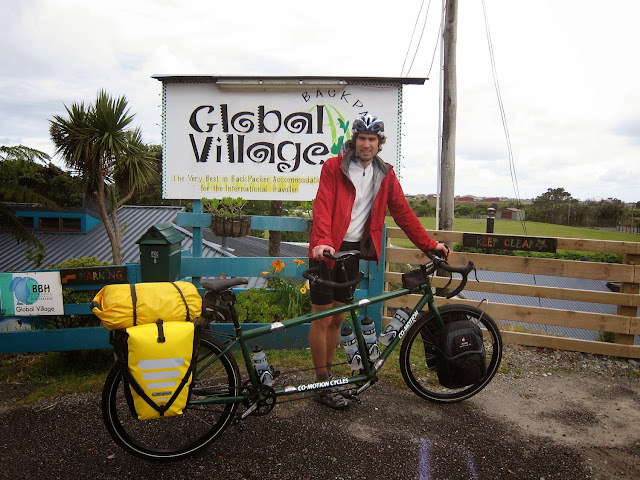 Arriving in Greymouth we then wobbled our way to the awesome Global Village Backpackers (definitely the place to stay in Greymouth) where we met an older German couple who were also cycle touring. We had a great time chatting away to them and getting excited about the ride ahead. As we discovered time and time again on this trip, our bike was certainly a talking point and all sorts of people would come up to talk to us. 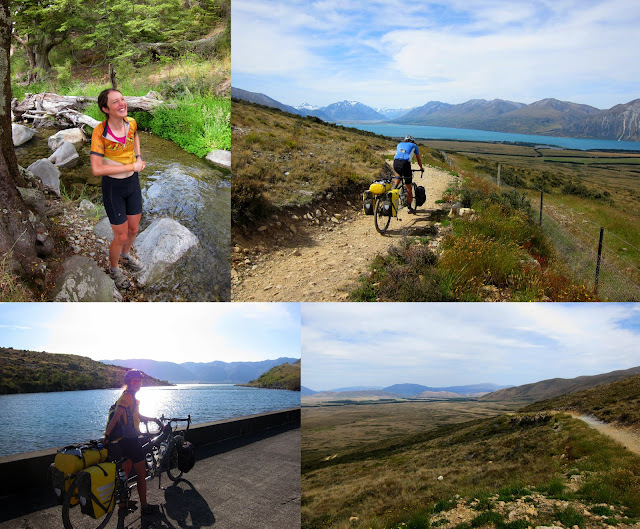 For our trip I'd basically linked together a selection of trips from the Kennett Brothers Classic New Zealand Cycle Trails book that took us down the West Coast and inland to Wanaka then over a couple of passes and through the Mackenzie Basin then back home again. Day One would see us start the West Coast Wilderness Trail which would take us to our accommodation for the night in the middle of nowhere, Cowboy Paradise. A nice easy day of about 70km or so mostly on gravel roads or cycle trail. 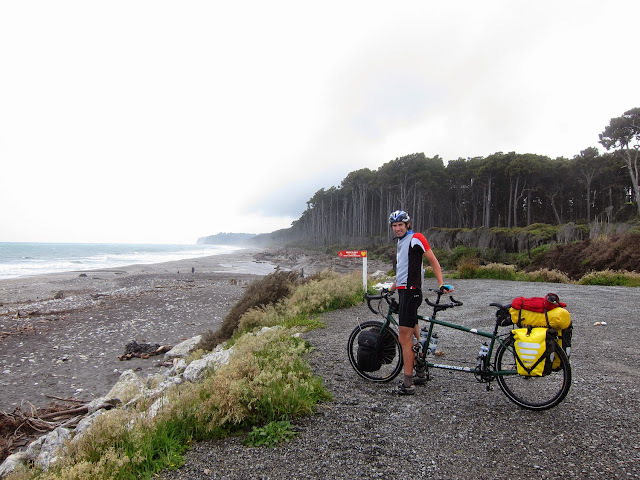 It was a bit overcast but a pretty nice riding temperature and we'd cruised along the coast from Greymouth and made it to Kumara by mid morning. From there the track turned away from the roads, cruising around the Kapitea Reservoir. It was beautiful and super quiet although we met another couple heading the same way as us and another couple heading the other way that we knew. Once we got close to Cowboy Paradise there were these ridiculously tight corners to get down the hill which were mostly definitely not tandem-friendly so we had to push round them (the ones we did ride I was squealing at the back!). We made it to Cowboy Paradise just after 2pm for a nice relaxing afternoon. An awesome and relaxing start to the trip. I should have made the most of it! A weather bomb was supposed to hit overnight but it didn't really happen as far as I could tell. It rained a bit but nothing too serious (well, for the West Coast which is notorious for rain) and we woke to a light drizzle and thick mist. Exciting! The first part of the trail swooped down off the hillside through beautiful native bush to the river. 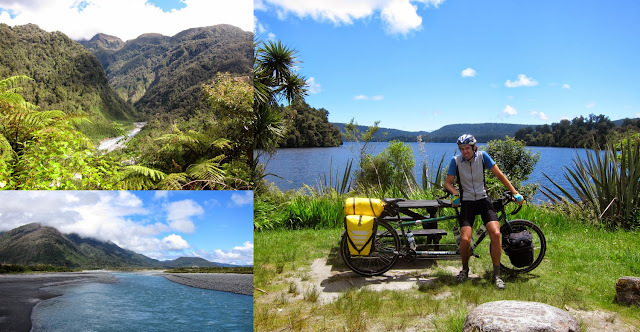 We then climbed up and over to Lake Kaniere and along the Kaniere Water Race which certainly raised my heartrate. It would be an easy track to ride by yourself but the track is narrow and drops off steeply on one side to the river and to the water race on the other side and on the back of the tandem all I can see are dropoffs! Super beautiful though. Before we knew it though we were in Hokitika where we attempted to cram more food into our bags from the supermarket and continued off into the now ridiculously hot and sunny afternoon. All was going so well with a beautiful track that cruised through the bush and a delicious picnic lunch. I should have known it was too good to be true because then came the final coastal section to Ross. We knew there was a chance this section of the trail was not complete but according to our book it was still rideable except it was a grade 4 instead of a grade 2 so we weren't that surprised to see a sign just before the coastal section saying the track was closed then a sign on the gate saying the road was unmaintained and to enter at your own risk. It all just sounded like a challenge. It started off all fine except for the bridges weren't all rideable so we either walked across them or through the streams. But the track steadily became more covered in gorse and particularly swampy. Pretty tough going for a tandem with no suspension and packed to the brim. But again, nothing we couldn't handle (apart from my wrist becoming pretty sore but that is pretty much expected these days). 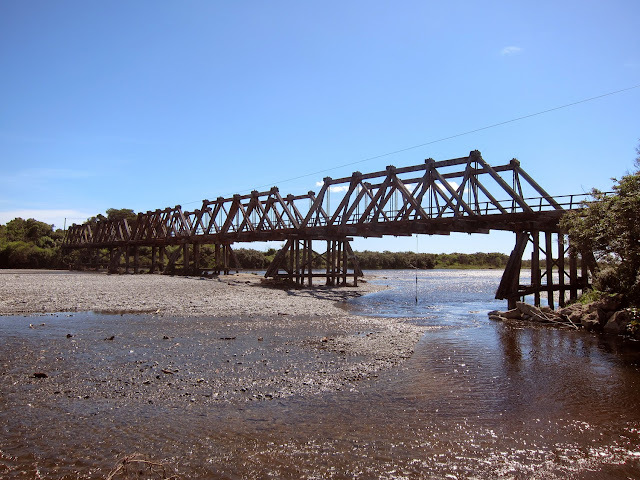 Anyway, with Ross in sight (the end of the trail) we came up to the final bridge across the Totara River...which was under structural repair and missing pretty much all of its floor missing apart from a very narrow plank and rather dodgy looking handrail. Not conducive to crossing with a bike and lots of gear. We tried to follow the side of the river out to the main road but were continuously blocked by endless rough, muddy farmland which seemed to end in scrub and more mud or the river, again. M also tried to see if the river was crossable but on the far side near the bank it became deep and fairly fast flowing. Not something to risk without knowing how deep it was, especially as we'd have to get all our gear and bike over as well.